An easily overlooked resort in a quiet setting, Chom Samed offers spacious and comfortable rooms in freestanding wood cabins or a three-storey polished concrete stack. Ad Book now! Rates from US$66++. Average rating 8.2 from 265 reviews. Around a dozen stilted dark-wood cabins overlook a lawn filled with frangipani, swings and hammocks, with an attractive three-storey concrete structure and the reception area on the other side. All rooms go for the same price, are roughly the same size, and come with good-size private balconies. Some of the cabins come with hardwood floors while others have tile floors, but all feature several swing-open windows, soft beds, large safes, wide LCD TVs, fridges and spacious hot-water bathrooms with two different kinds of showerheads. Reached by stairs, rooms in the concrete building are identically equipped but come with wider glass windows and lighter-grain wood walls -- these stay cooler without the air-con running and we actually preferred them over the cabins. All four of the rooms that we inspected were squeaky clean. While minimal English is spoken, the owner and a staffer who showed us around were both exceptionally polite and welcoming. This came as a pleasant surprise on Samet, where so many staff are unenthusiastic or disgruntled. The location is very quiet and the best part of Ao Noi Na’s beach is no more than a five-minute stroll away. The owner provides free breakfast and WiFi, and rents out mountain bikes for exploring. We were quoted the low-season rate in early March. Last updated on 23rd April, 2016. 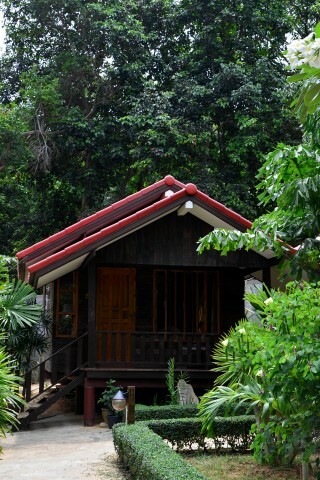 Check rates at Chom Samed Resort on Booking.com.